I get very excited when I have the privilege of teaching an adult how to swim. It takes courage to start, and usually that is the hardest part. Like the measured step approach I use with children, I begin the same way with adults. My highest priority is to build confidence every step of the way. Keep in mind, it’s never too late to learn! Anyone can learn to relax, feel safe, and swim in water. The process requires patience and making a commitment to practice. I’ll help with knowing what to practice and how to bring the routine of going to the pool into your life. To get started, sign up for a 30-minute private lesson. After the first lesson, based on my recommendation and your preferences, you can either continue with private or semi-private lessons until you’re ready to join a group, or join a group that is suited to your skill set. The two groups I offer are: Beginning Adult and Stroke Development for Adults. When I started, I had never learned how to swim and could just barely tread water. With much apprehension, sputtering, and flailing, you introduced some incredible sequences of very specific drills to help me overcome my apprehension, learn to breathe, and to develop a proficient freestyle stroke. Beyond that, though, you helped me learn to integrate swimming into my life as a regular part of my exercise program, and with your experience as a runner and cyclist, you helped me develop a balanced exercise program. As if that wasn’t enough, your guidance on matters of nutrition, biomechanics, and life-in-general make you my Most Valuable Coach of the year. 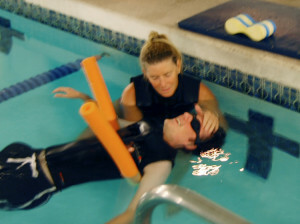 When I started swimming with Beth, I was 33 and could not swim a stroke. I had bad swimming experiences as a child and never took to the sport. As time progressed, my fears of the water and swimming grew, and I thought that I may never be a swimmer. My biggest challenge was not being able to get my face in the water without holding my nose, nor was I comfortable in water I could not stand in. We started off slowly and by the end of the first lesson I was able to swim underwater without holding my nose. After this we took it one week at a time, gradually building my skills. I continued to take private lessons with Beth for three years. During this time we worked on my technique and skills in learning the crawl, breaststroke, and backstroke. I have particularly enjoyed Beth’s attention to detail and emphasis on learning proper technique as the method to become a faster and more confident swimmer. Beth is the first instructor I have encountered who provided positive reinforcement and encouragement to help me along. During the summer after my second year of lessons I did my first open water swim. It was a 1 mile swim across the lower section of Lake George in the Adirondack Park in New York State. It was a great accomplishment, particularly when I never could have conceived of such a thing only two years before. I now train five days a week, incorporating many of Beth’s drills into my workouts. I am training for marathon swimming competition: these are open water races of three or more miles. When I think of what I have accomplished due to Beth’s instruction and coaching, I can hardly believe it. To have gone from zero skills and fear, to complete comfort and excitement to go swimming every day, really is beyond words. I would never have gotten there had it not been for Beth.